Prior to the Galaxy Unpacked event, which is scheduled to take place on February 20th, new leaks of the Samsung Galaxy Watch Active with One UI have surfaced online. Not only this, there are also some images of the Samsung Galaxy Buds, the Gear IconX successor that will reportedly be bundled with the Galaxy S10 on pre-orders in select regions. Samsung Galaxy Watch Active is the next smartwatch the company will be launching and reportedly would come with some significant design and hardware changes. It is expected to be the successor to the Samsung Gear Sport, which was launched back in 2017. Now, as per a recent leak by SamMobile, there are various unique and new watch faces with Samsung’s One UI elements as well as the dark background clearly visible in the images. Among these, one watch face comes with the health-related feature, which seemed to be the redesigned Samsung Health app with workout tracking and goals. 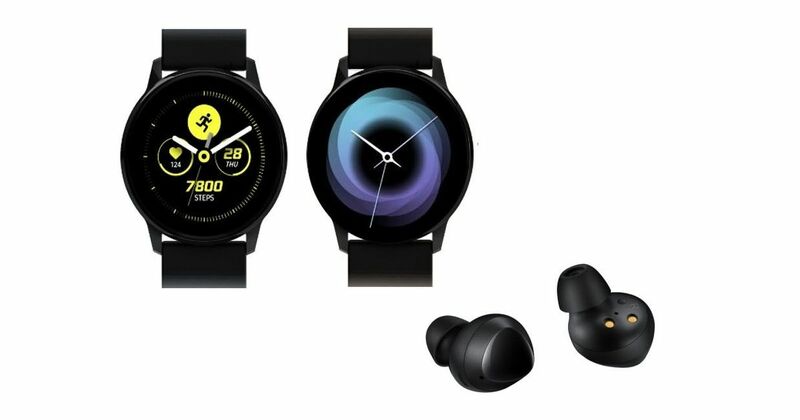 Reportedly, the Galaxy Watch Active would include a function to monitor the heart-rate continuously as well as give a notification to users if it reaches over the threshold level while they are inactive for more than 10 minutes. Speaking about the specifications of the Samsung Galaxy Watch Active, it would flaunt a small display (than the Gear Sport) of 1.1-inch. In terms of hardware, it would pack Exynos 9110 chipset. The smartwatch would have the support of Bluetooth v4.2, NFC and would offer 5ATM water/dust resistance. In another leak by SamMobile, this one about the Samsung Galaxy Buds, we can see the earbuds will be the same as the Gear IconX from 2018. However, it will reportedly come with some notable changes in the specifications. The earbuds is said to come with a 58mAh battery, while the charging case have 252mAh battery pack. These numbers are smaller than those of the IconX, which has 82mAh earbuds and 340mAh case. As of now, it is not clear how the decrease in battery size would affect the battery life; however, it should be noted that these will support wireless charging – so if you have the Galaxy S10, you can use the handset’s reverse wireless charging feature to charge it on the go. The report also says the Galaxy Buds would feature Bluetooth v5.0, 8GB of onboard storage, and IPX2 rating for water-resistance.